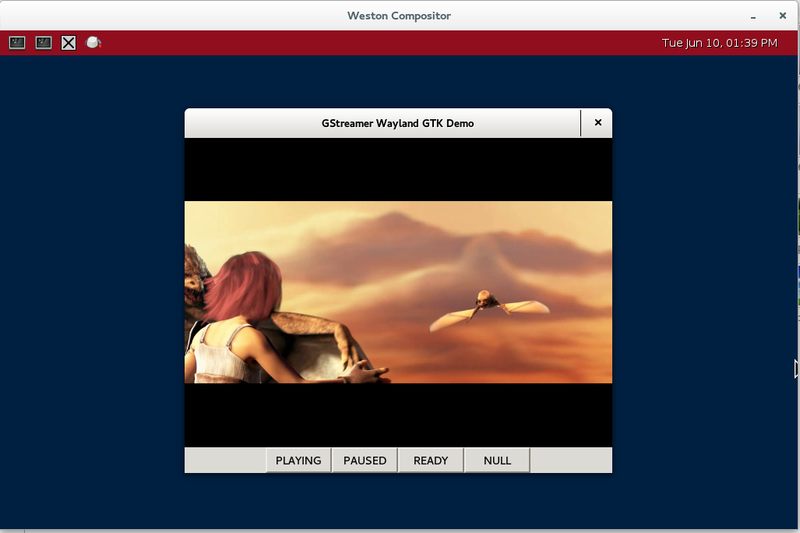 During the past few months I’ve been occasionally working on integrating GStreamer better with wayland. GStreamer already has a ‘waylandsink’ element in gst-plugins-bad, but the implementation is very limited. One of the things I’ve been working on was to add GstVideoOverlay support in it, and recently, I managed to make this work nicely embedded in a GTK+ window. I’m happy to say that it works pretty well, even though GTK does not support wayland sub-surfaces, which was being thought of as a problem initially. It turns out there is no problem with that, and both the GTK and GstVideoOverlay APIs are sufficient to make this work. However, there needs to be a small addition in GstVideoOverlay to allow smooth resizing. Currently, I have a GstWaylandVideo API that includes those additions. I believe embedding waylandsink in Qt should also work without any problems, I just haven’t tested it. If you are interested, check the code. The code of the above running demo can also be found here, and the ticket for merging this branch is being tracked here. I should say many thanks here to my employer, Collabora, for sponsoring this work. Posted in GStreamer.Tagged Collabora, gstreamer, multimedia, video, wayland.